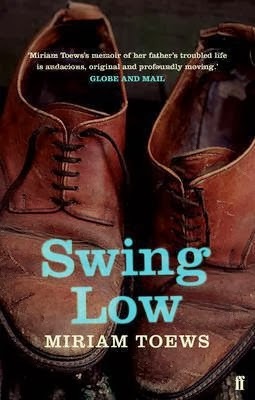 Swing Low by Miriam Toews is a brave and interesting novel. Based on her imaginings of her father’s life long battle with manic depression, the book explores what it means to suffer in silence. Using research from family members and drawing on her own experience, this is a story which combines fact with interpretation. From the moment he was diagnosed as a young man, Mel Toews is told categorically that he will not be able to lead a normal life; he is even advised against having a family. Yet Mel proves his doctors wrong, marrying the love of his life, Elvira, having two daughters, and working as a successful and highly regarded high school teacher. Mel largely maintains his life by keeping silent about the reality of his day to day struggles. Miriam brings her father to life in the pages of this book, creating a strong, sympathetic narrator. She portrays the more difficult, unstable periods of his life with great sensitivity, and the reader gets a real sense of the small town setting which was the backdrop for Mel’s life. This is a book which is rich with family history; hidden resentments and private strength. While it is undeniably a sad tale, it is also testament to the real power and resilience of the author’s father. It’s the best kind of eulogy.